Wanbdi Wakita was a presenter at our Voices of Wisdom event that took place in Asheville, North Carolina on May 21st and 22nd, 2016. Wanbdi Wakita, whose name translates into English as Looking Eagle, was born at home with the help of a midwife on a breezy day in October in the community of Sioux Valley Dakota Nation. It was 1940. Overseas the world was at war, but a different kind of struggle was taking place at home. The heavy hand of the Indian Act reached into the lives of Indigenous people in Canada, squeezing tightly. The control of the Indian Act was smothering. Traditional Spiritual Ceremonies were outlawed. Nevertheless, as a boy, strange and remarkable things began happening to Wanbdi. He saw miracles and sacred things. He heard voices talking in his ear when no one else was around. At first, these things were very scary to him. One day he was playing pow wow dancing down by the river. He was the singer, the rest of the boys, dancers. Carefully, they tore long grass from the ground, tucked it into their pants and shirts to make their dance outfits. With a crooked stick, Wanbdi pounded out a beat on a big tree stump, singing loudly, eyes closed. When the song finished Wanbdi opened his eyes to see the boys running away as fast as they could. Standing beside him was a little man about two feet tall dressed in brown pants with fringes on the sides, a button shirt, vest and round hat. He was smiling at Wanbdi from ear to ear. He was so startled he took off at a full gallop. These sacred experiences were part of his spiritual preparation. After surviving eight years of residential school and serving six years in the Canadian Armed Forces, Wanbdi continued to experience profound visions. As he surrendered to Creator, he learned he was being called to become a Wicasa Wakan or Holy Man. Today, Wanbdi embodies and transmits the Dakota ways of living as a Wicasa Wakan. 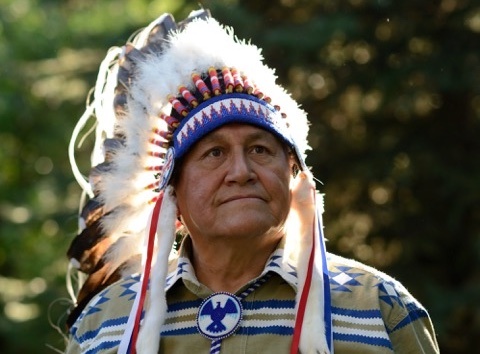 He has devoted three decades to working with men in prison, teaching the Dakota language, dreaming and overseeing many Sundance ceremonies as Sundance Chief, sharing songs and stories. Wanbdi is gentle and soft spoken, a man of integrity and profound wisdom. He possesses a rare breadth of traditional and culture knowledge, which he combines with a message of healing and unity between all nations. To find out more about his work, visit his website. I am grateful that Wanbdi and Pahan have connected with the the Sacred Fire Foundation. As language keepers, singers, and ceremonial leaders, they embody ancient perspectives for today. With love and healing as their guiding principles, they honour the spirit of life, breathing in all things – All Our Relations. I am excited that my heart led me to learn from the Dakota ways of life, as well as about the aliveness and connectivity of community through Sacred Fire. Now, these two realms are coming together with the SFF’s Voices of Wisdom event in Asheville. Amazing! Hip hip hooray! So happy to receive Wanbdi even though I will not be there. Welcome so large and thank you for courageously carrying the ways of your people through terrible hardship and heartbreak.